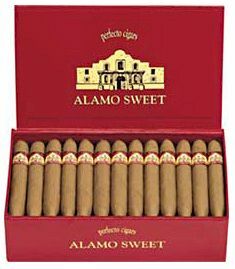 If you are a Swisher Sweet fan, you have to give Alamo Sweet brand a try! Made with Homogenized wrapper and binder and a select blend of good quality Nicaraguan and Connecticut fillers, these cigars have great tobacco taste. An old-time sweetening formula on the tobacco gives them a delicious flavor. Your choice of light natural or dark maduro wrapper. Size is 4.75" x 46 ring.